For a business site - the company address, contact number and an email address that is checked regularly. For a personal site - you can just give an email address. For both sites you will also want a contact form that allows the person to leave their name, email, a subject and a comment. This will be sent automatically to an email address you have set-up. Having a contact us form on your page allows people to send comments that may be helpful for you on the site. You want to make the form as easy and straight forward as possible but it also has to get the information you need. 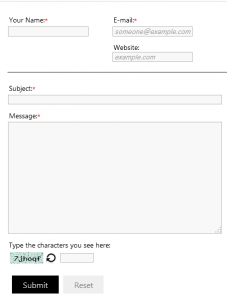 The sample form here shows want you want to get from your readers. You need to get their name and Email address, you can get there website if they have one - you can use this to see what they are interested in and if you can help them with anything. Let them enter a subject for their comment - this helps you organize your messages. The comment box is where they fill in their comment. The submit button will link to your selected Email address. The reset button will clear all fields for the person to start again. Some people will use the form on this page as an opportunity to contribute information on your subject matter, you want to redirect them to use the comments for this as it can help your exposure. So add a point on the page asking them to use the comments section at the bottom of any of the posts, remember to thank them for this information.